Notices are often issued to people serving as an announcement, a notification, or warning about a certain matter. Notices provide specific information about a certain subject or fact to the parties concerned. For example, a landlord issues a warning notice to a tenant if he/she commits a violation of the terms and conditions of their agreement. In the workplace, employees are required to give a two-week’s notice letter if they want to resign from their current position, instead of quitting without notice. Also, employers issue a notice to employees as a warning if a certain employee has violated rules in the workplace. 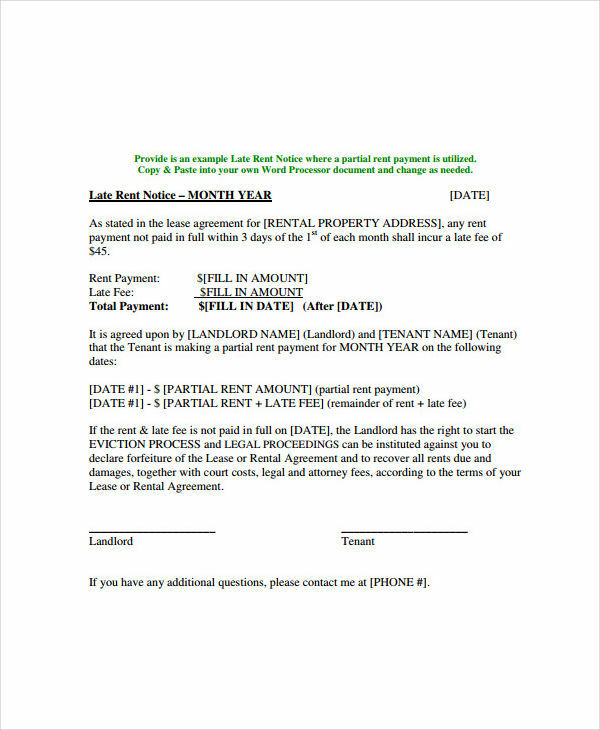 Landlords give tenants a specific date of paying their monthly rent payment. However, there are instances when tenants pay late, for certain reasons. 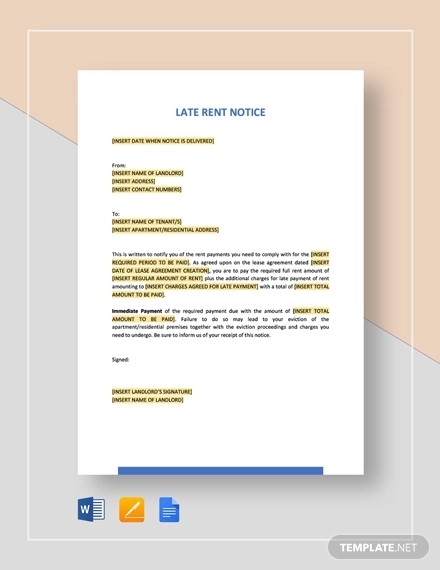 And if the tenant misses the due date many times, the landlord may issue a late rent notice examples in word. 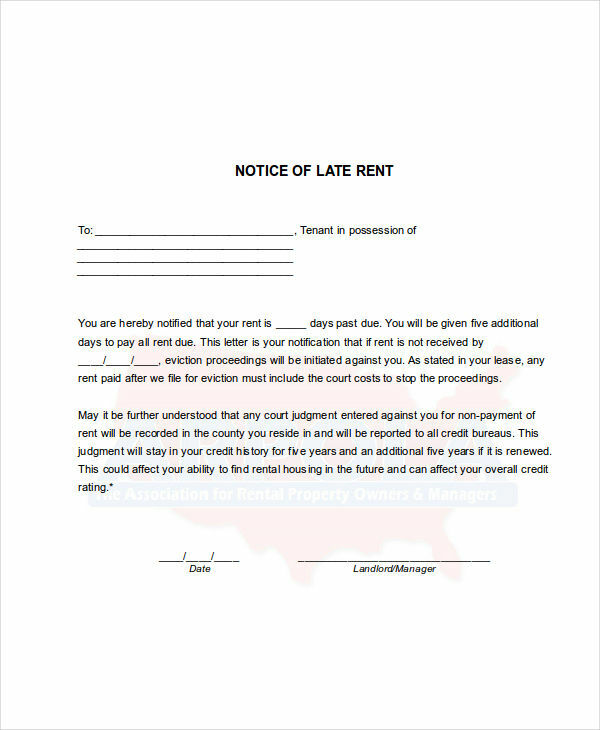 By definition, a late rent notice is an official document issued by a landlord when a tenant’s rent payment does not come on or before the due date. 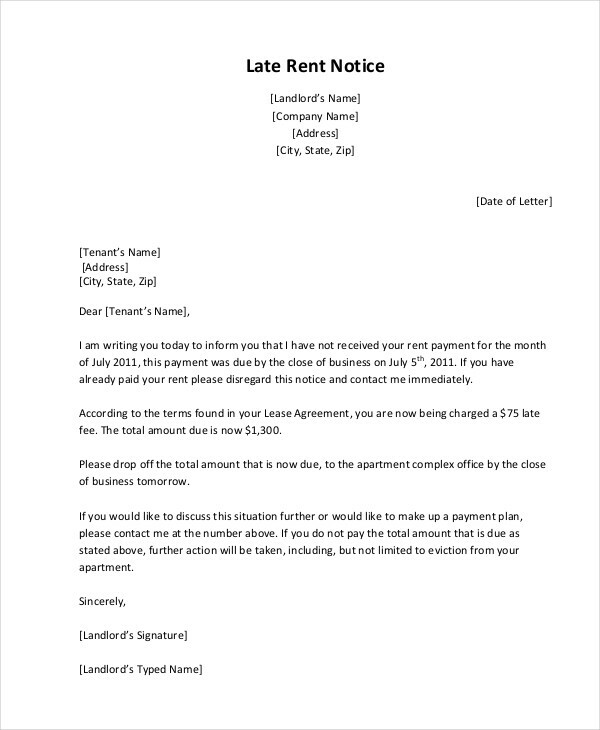 Typically, late rent notices contain the due date of the payment, amount of time the payment was late, any late charges, and attached lease agreement. 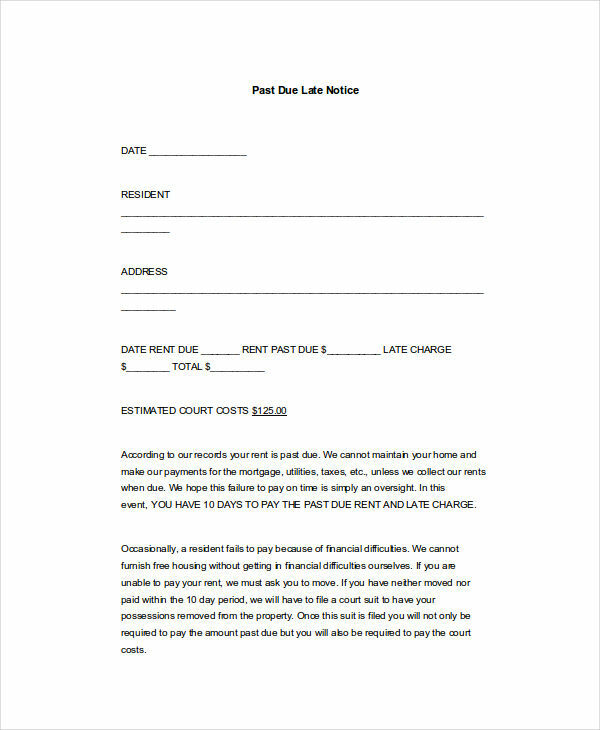 Late rent notices promote proper communication between a tenant and a landlord. 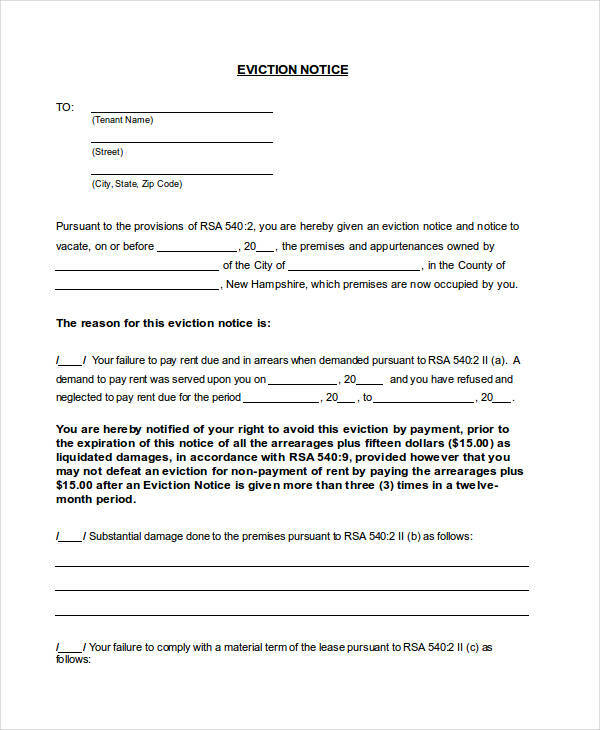 Basically, if a tenant is always late for paying rent, the landlord has the right to immediately issue an eviction notice. However, in most cases, the landlord is first required to issue a late rent notice before evicting the tenant. 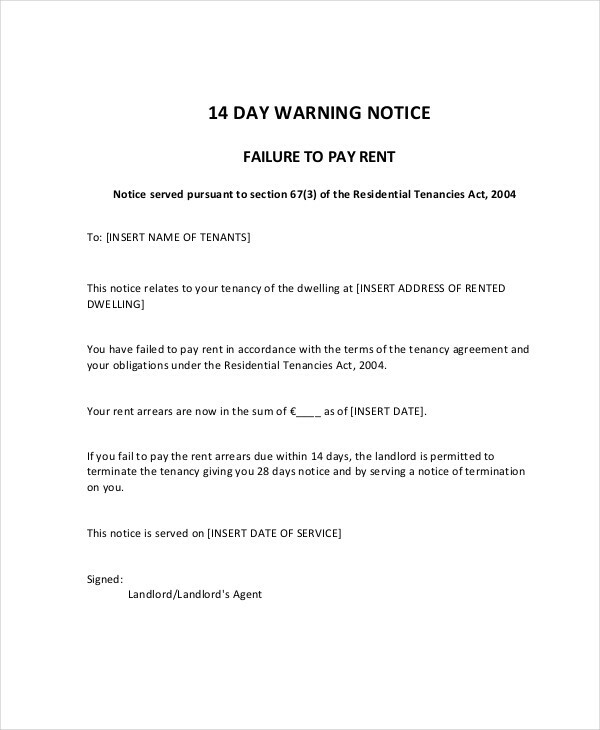 This serves to warn the tenant that he/she has been violating their agreed date of rent payment, and that the landlord will exercise his/her authority and take further action if the tenant notice does not oblige. If you are a landlord, there will always come a time when evict a tenant because of certain reasons. Still, some landlords hesitate when evicting a tenant free notice who always pays the rent late, thus they issue a late rent notice instead. Think of a goal. In this case, your goal is to inform or warn your tenant to pay the rent on time and to make him/her want to pay the rent on time. Write the content carefully. Make sure everything you write is accurate. 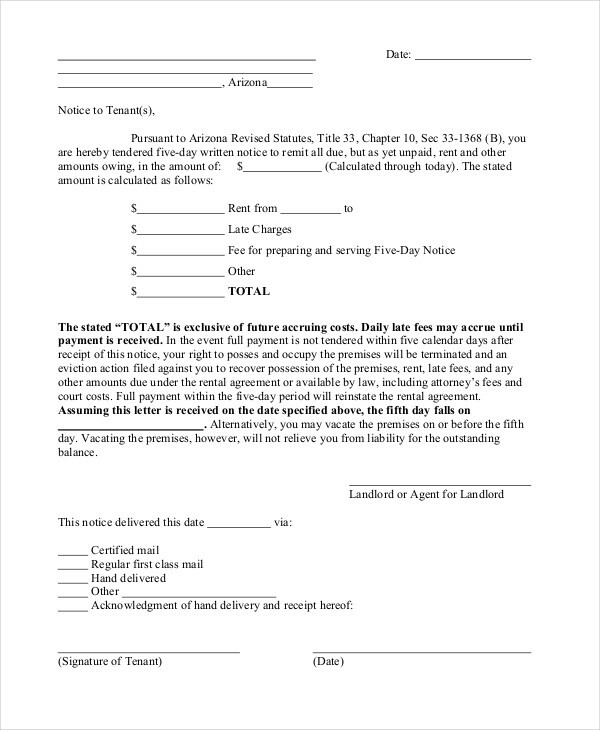 You may attach other documents, like receipt example to support your notice. Make the notice sound formal and authoritative. You need to establish your authority without sounding too casual or offensive. Make your notice short. 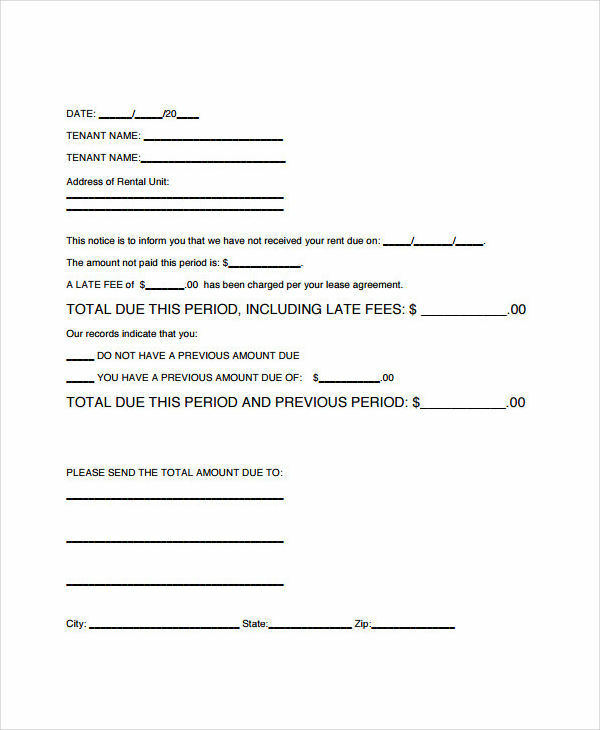 You only need one page to inform your tenant notice short about his/her violation of your agreement. Use simple language. In writing your notice, you need your tenant to understand what you mean so use simple words, and keep your sentences short. Proofread your notice. You need to review the points you stated. You also need to check for errors in the content and other errors. At times, it is better to have someone review it for you. Sign your notice. This will validate your notice pdf, in addition to making it look official.